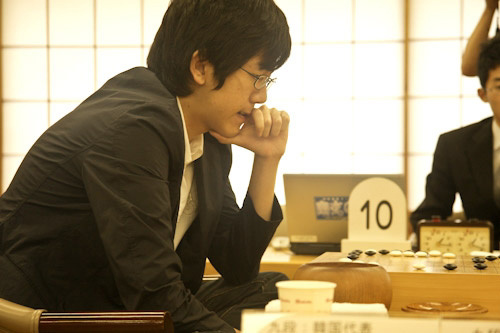 Cho U won the third game as well against challenger Yuki Satoshi and defended his Gosei title with straight wins, 3:0. Yuki, playing white, started with an unusual opening again (his 4th move was on the 4X6 point!) but lost in the end by 1.5 points. Cho holds 5 of the 7 major Japanese title. I wonder if he will become Kisei challenger – he started the league well, 2:0, but it is way too early to know for now. Hane Naoki defeated challenger Takao Shinji by 4:2 and keeps Honinbo title for one more year. Hane, playing black, won the 6th game by 5.5 points. The game record is here. Hane captured this title from the same Takao last year, in a dramatic finale: Takao was leading the titile match 3:0 when Hane won the 4 remaining games. 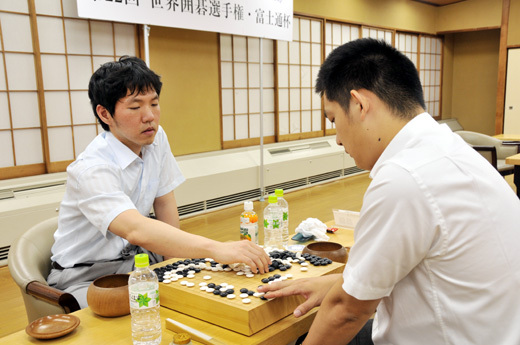 The sixth game of the Honinbo title started yesterday in Japan, and will be concluded today. Hane Naoki, title-holder, leads 3:2 so far in this match, and only needs one more win to keep his title for one more year. Here is the position after day one. Hane plays black. 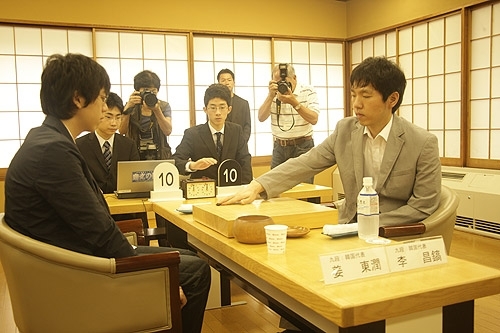 Takao Shinji, the challenger in this match, handed the sealed move to Cho Chikun, main referee. At a recent conference in south Florida economist Ed Yardeni opined: “America is trying to figure out how to provide free everything for its citizens, while China is trying to figure out how to get its next million barrels of oil!” Adding to that was Jeff Saut, another 40-year market veteran: “Indeed, while America is playing Texas Hold’em (aka, play one hand at a time), the Chinese are playing the game GO. In the strategic game of GO, a player sacrifices numerous “pieces” in the short-run to “win” in the long-run.” GO is a 2,500-year-old game where one of the most important skills required for strong play is the ability to read ahead. Some claimed that GO is the most complex game in the world due to its vast number of variations. Plays made early in the game can shape the nature of conflict a hundred moves later. GO sounds similar to investing to me. The link to original article is here. 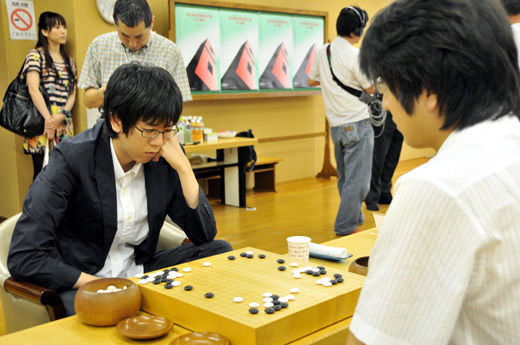 Cho U, title-holder, defeated Gosei challenger Yuki Satoshi by 13.5 points in the second game of the title match. Cho U won the first game as well, and since Gosei has a best-of-five system, he needs only one more win to keep the title. Yuki Satoshi has a very interesting style: his openings are quite non-standard, which leads to interesting games with many fights – this one makes no exception. When in time-trouble and with lots of exchanges happening late in the game, one may simply not be able to count accurately. When one doesn’t find “the proper time to resign”, games usually continue till the very end. When one doesn’t feel like resigning. Historically, Sakata Eio, one of the most famous professional players in Japan, was well-known for playing till the very end even in games where we lost by over 20 points difference. For the complete tournament table, see this link. The third game will be played on July 21st. Kang Dongyun, playing white, won by 2.5p against Lee Changho, thus winning this year’s Fujitsu Cup, one of the top international tournaments. This seems to be Kang Dongyun’s first international win. You can read an older interview with him, translated from Korean by Alexander Dinerchtein, here. Great photos and English blog-entry about Fujitsu final here. The international Fujitsu Cup semifinals took place in Tokyo, Japan, with three players from South Korea and one from China. 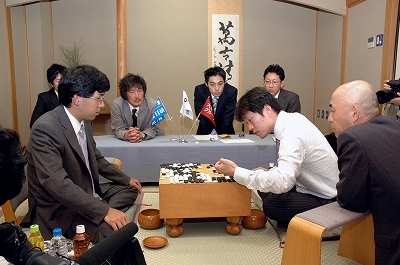 The last Japanese players were eliminated in the quarter-finals, when Kono Rin had lost to Park Yeonghun and Yamashita Keigo had lost to Lee Changho. The last year winner, Gu Li of China, and the player with the best international results during the past year, was eliminated earlier by Kono Rin. In one semifinal Lee Changho took revenge from Chang Hao, to whom he lost Chunlan Cup final by two straight losses, and won by 4.5 points. Game record is here. Lee Changho made use of some very interesting ladder-break – see move 20. It looks like modern Go is more and more open, and there are less and less “sacred cows” as far as good-bad shapes go, or as far as “not supposed to play this way” situations go. In the other semifinal, Kang Dongyun defeated Park Yeonghun by resignation. The one-game final between the two South Korea finalists, Lee Changho and Kang Dongyun, will be played on July 6th in Tokyo, Japan since Fujistsu, the sponsor of this tournament, is a Japanese company. You are currently browsing the 361points.com/blog blog archives for July, 2009.